The 3 Steps Oil Eliminating Skincare Regimen from Kiehl’s – Specially designed for the Men! Hands up if your Boyfriend / Brother / Husband is using your skincare products and complaining that it isn’t working for him!. My husband is not an exception and he always says that my skincare products will cause his skin to breakout (but he will never stop using them. LOL!). The reason behind is that Men’s skin differ from Female’s skin as it will be thicker and tougher (due to higher amount of Male Hormones- Androgen). Sebum secretion for Male will also be greater due to Androgen and hence skin will be oilier with enlarged pores and acne will be longer lasting as well. Men will also sweat more than women, which exacerbates the sensation of greasy residue on skin. These sebum related factors plus environmental pollution combine to make men more likely to feel that they have greasy, dirty skin. As a result, men with oily skin can be hesitant to apply any skincare products for fear of making the situation worse. Hence to better address Men’s top skincare concerns: OIL, SHINE, PORES, it is better for them to use skin care that’s formulated for the male! In August, Kiehl’s has launched a super exciting range (Oil Eliminator) for Men after scouring the planet looking for the best, most effective ingredients. This time, they went a bit further by venturing into outer space. It’s Game Over for Greasy, Dirty Skin! 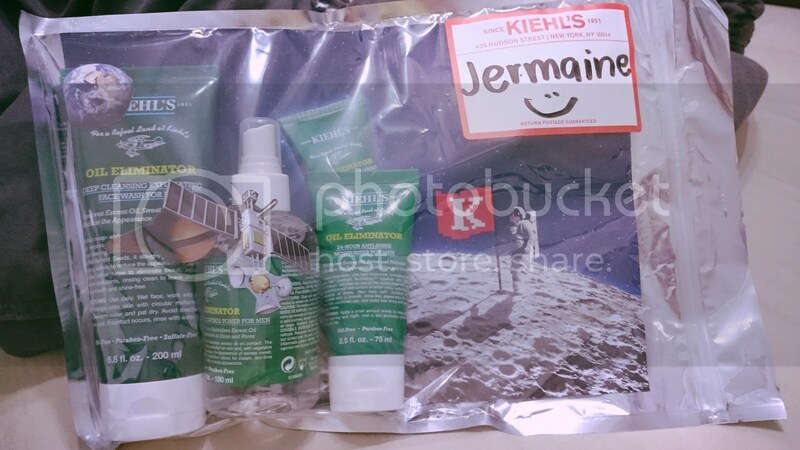 Utilizing cutting-edge space-age technology, Kiehl’s (a pioneer in men’s skincare since the 1960) introduces the Kiehl’s Oil Eliminator 24-Hour Anti-Shine Moisturizer for Men. To complement this formula, Kiehl’s proudly offers two additional formulas, Kiehl’s Oil Eliminator Deep Cleansing Exfoliating Wash and Kiehl’s Oil Eliminator Refreshing Shine Control Toner for a complete oil eliminating regimen. 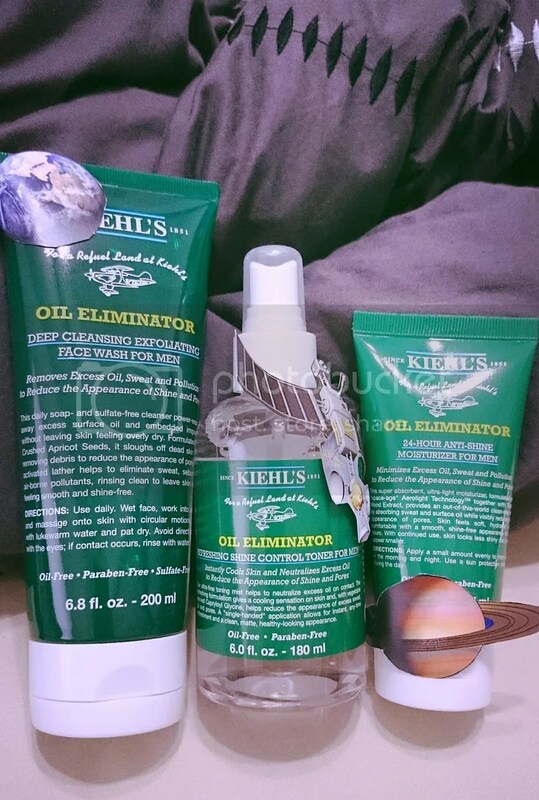 Kiehl’s Oil Eliminator formulas are allergy and dermatologist tested (on Asian skin) and are suitable for sensitive skin. They are also non-comedogenic and non-acnegenic, therefore they will not clog pores. 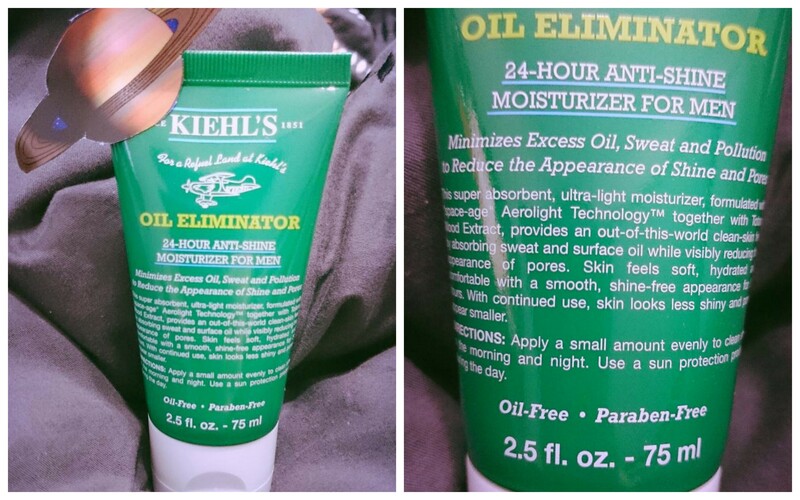 INTRODUCING KIEHL’S NEW OIL ELIMINATOR! 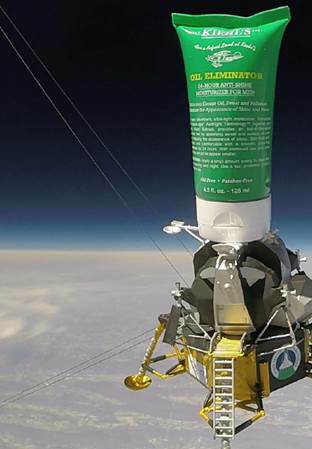 To develop the Kiehl’s Oil Eliminator 24-Hour Anti-Shine Moisturizer for Men, Kiehl’s chemists put the space-inspired Aerolite Technology™, an advanced material based on the science of aerogel, which has historically been used in space exploration to good use. Aerolite Technology is the lightest solid material on Earth because it is composed of up to 99.98% air by volume, helping to provide a weightless feel on the skin. The Aerolite Technology has highly porous structure and large surface are which allows better absorption up to 4 times its own weight in oil, providing efficient sebum absorption capabilities. It will also disperses and vaporizes sweat away from the skin because of its super hydrophobic behavior. The material’s irregular surface scatters light, which creates a matte, optimal skin appearance and results in reduced visibility of pores and skin imperfections. With Aerolite Technology & other highly effective ingredients from nature, Kiehl’s Oil Eliminator is the best solution to combat oily skin. With daily use, the three new products will effectively reduce the presence of excess oil caused by sweat, sebum and pollution, helping to mattify skin and immediately minimize the appearance of pores. With continued use, skin will feel rebalanced and the appearance of shine and visible, enlarged pores is reduced. Kiehl’s New Oil Eliminator 3 steps regimen is formulated to defeat shine and oil for refreshing clean & well hydrated skin. The first step to get rid of excess oil and greasiness is to do proper skin cleansing with the Oil Eliminator Deep Cleansing Exfoliating Face Wash. This soap-free and sulfate-free cleanser is designed for daily use to wash away dirt and excess oil without stripping skin. Formulated with finely crushed exfoliant from the seeds of apricots, it gently sloughs off dead skin cells, removing debris to reduce the appearance of pores and to refine skin texture. It rinse off clean to leave skin texture feeling smooth and virtually shine-free. Many men will think that by using cleanser will suffice to keep their skin clean and oil free. But little did they know that the use of toner is just as important as it is also part of the cleansing process to remove leftover residues that aren’t removed by the cleanser. 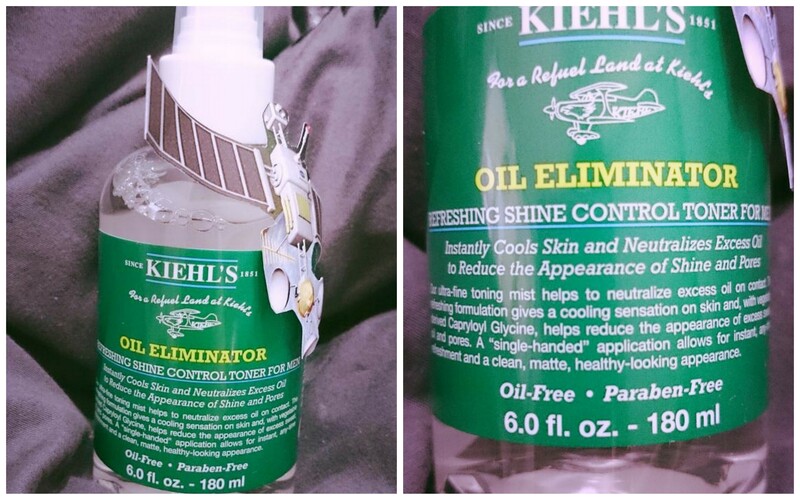 Hence, Kiehl’s recommends the use of the Oil Eliminator Refreshing Shine Control Toner to helps to reduce excess oil on contact and also to keep skin clean. The ultra-fine toning mist has a refreshing formulation to help provide a cooling sensation upon contact while vegetable-derived Capryloyl Glycine ( vegetable-derived amino acid) helps reduce the appearance of excess sweat and oil. A “single-handed” spray application allows for instant, any-time refreshment and a clean, matte, healthy-looking appearance. One last step to matt and shine-free healthy looking skin is to keep it well moisturized. Many men also have this misconception that moisturizer will make skin oiler and there is no need to use one due to the humid & hot climate in Singapore. The fact is when skin is dehydrated, the skin will secrete more sebum as usual to compensate for the lack of moisture! Hence, using moisturizer leads to oiler skin is just a myth as it is dehydrated skin that causes skin to be oily and more prone to acne! To make sure that the skin stays moisturized, matt and balanced, the star product from the Oil Eliminator range – 24-Hour Anti-Shine Moisturizer for Men will do the job well! Coupled with oil-absorbing Aerolite Technology based on the science of aerogel, the formula helps absorb existing oil and sweat instantly and throughout the day to give a matte, virtually shine-free appearance. Cupped with Totara Wood Extract, the 24-Hour Anti-Shine Moisturizer will also help to reduce the visibility of pores. Totara Wood Extract comes from the Totara Tree which is indigenous to New Zealand; it is known to be extremely resistant to decay due to its antimicrobial and potent anti-oxidant activity. Upon first application, skin will feel soft, hydrated and comfortable with a smooth, virtually shine-free appearance. With continued use, skin looks less shiny and pores appear smaller. Have passed the entire set of products to my hubby as he told me he needed something to maintain his skin. In the past, his skincare routine only consists of a cleanser but as time progresses, he’s facing more skin issues like oilier skin, dilated pores and breakouts! It’s never too late to start and i told him to start it off with a simple 3 step skin regime – Cleanse, Tone and Moisturize. 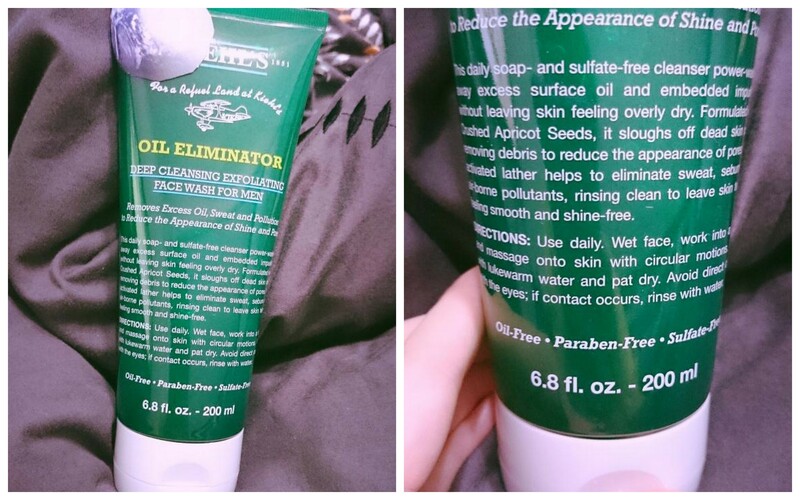 When my wife first passed me the face wash, i was quite hesitant to use it on a daily basis as the facial wash contains exfoliating beads.. Facial wash that contains beads doesn’t go well with my skin as it will tend to cause me to have breakouts (Maybe the ones that i used in the past were too harsh for my skin). Despite this, i have decided to give exfoliating facial wash another chance and i’m glad to have taken this step… Have been using it on a daily basis and there’s no breakouts.. 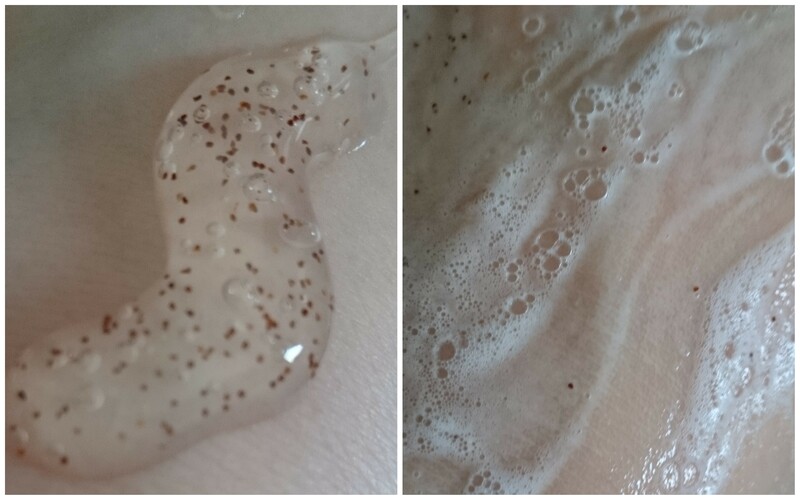 The Oil Eliminator Deep Cleansing Exfoliating Face Wash is very gentle on skin and it leaves my skin feeling clean & refreshed (without over-drying it). Due to its thick texture, it lather very well so a small amount will suffice during each wash.. The finely crushed exfoliant from the seeds of apricots + the thick texture of the facial wash makes usage pleasant and harsh-free. The face wash has a minty smell and it makes my skin cleansing experience an energizing & refreshing one! Two words to sum this product – Cooling & Refreshing! I have never use a toner in my entire life and my first encounter with toner is fuss-free & refreshing. All i need is to spray it directly on my skin after skin cleansing and it will instantly perks up my skin. There’s no need to use a cotton pad and this is why i find this product very easy, quick and refreshing (it has the same minty scent as Deep Cleansing Exfoliating Face Wash) to use. Besides being refreshing, it doesn’t cause any stinging sensation while using it (even on freshly-shaved skin). I have a ‘moisturizer is redundant’ policy as i always think moisturizer is only useful if weather is cold and dry! Decided to use this moisturizer only in the morning before i head to work as i have to spend long hours in an air-conditioned environment. Like the rest of the Oil Eliminator products, the 24-Hour Anti-Shine Moisturizer has the same minty scent and there’s a refreshing cooling sensation upon application. Texture wise, it is gel-based and it gets absorbed into my skin instantly without leaving my skin feeling heavy / sticky. It also leaves my skin looking and feeling matt! I felt that my skin is less greasy after using the moisturizer and skin also appears to be calmer (less irritated looking). Overall, i felt that the three products are designed to be used in our hot & humid climate. It works very well to keep skin feeling refreshed and shine free. Best of all, they are not harsh nor too rich! Will highly recommend it if you want easy to use skincare products that’s effective in keep skin matt and not weigh your skin down. City #01-321 t: 6336-9338 | Westgate #01-34 t: 6465-9941 NEW! My experience with Dr. Belter Cosmetic – Natural & Organic Skincare At Its Finest!